Different channels -- different values. 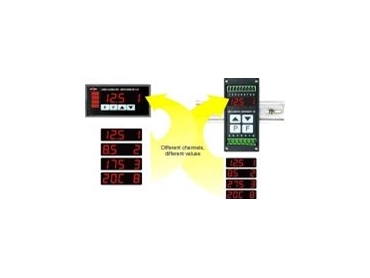 THE PM4-RS panel mount monitor and the RM4-RS DIN rail mount monitor, manufactured by Amalgamated Instrument Co (AIC), have been enhanced to allow it to be used in many different display modes. • Direct Display mode - ASCII string from most devices. • Poll mode - up to eight characters can be sent to request data. Can communicate with most devices. • Arithmetic mode - accepts data from up to eight RS485 or RS422 sources and combines the data arithmetically. Function available for AIC products. • Scanning mode - scans up to eight inputs from other AIC products and displays the value with an indication of which input is being viewed. A special mode allows the PM4-RS or RM-RS to act as a slave display when connected to a TP488 eight-channel scanning monitor. • Comma Separated mode - the PM4-RS or RM4-RS will accept up to eight display values sent sequentially and separated by a comma. The values can be manually scanned or set to display automatically. • Wind Speed And Direction (NEMA) mode - this is a specialised mode used only with the model WS-MMW-005 solid state wind speed/direction sensor. Wind speed and wind direction displays are toggled using the pushbuttons on the front of the instruments. Setpoint/alarm relays in the PM4 or RM4 monitors can be set against the input channels. This allows alarms to be raised in a control room, for example, as well as at the source. These enhancements give a lot more control and information than mere repeater or mimic displays and will find wide spread use in situations where critical parameters need to be monitored and critical situations alerted remotely.